Our cleaners deliver WOW results in your home and our Customer Service team backs it up with the best customer service in Australia. This is fundamental to our identity. We’re here to chat 7:30am – 7:00pm Monday to Friday, 8:00am – 5:00pm Saturday. We have very high expectations for our cleaning partners and get feedback from you on every clean they do. Unlike others in the industry, we also believe it’s non-negotiable to make their lives easier and pay them fairly. You can feel good about hiring a Maid2Match cleaner. Delivering a single 5 star experience is not difficult. Consistently and regularly delivering the same 5 star experience across thousand’s of home is. 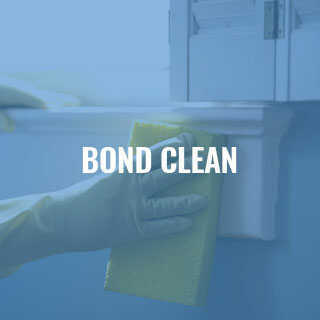 We have a 73 point cleaning system for our regular homes to ensure we are always hitting the mark. WHY ARE MAID2MATCH CLEANERS THE BEST? Want to know who’s behind the brand? Wondering how we deliver the results we do? Check out this video we’ve put together below! Maid2Match is proud to be a registered NDIS provider for house cleaning in Queensland. To find out more visit our NDIS Cleaning page or to book online click the Book Your NDIS Service button. 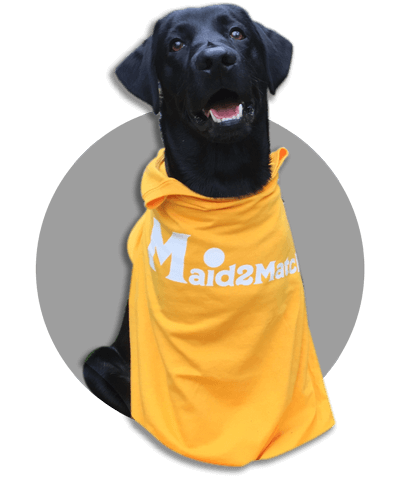 Percy is Maid2Match’s biggest fan! 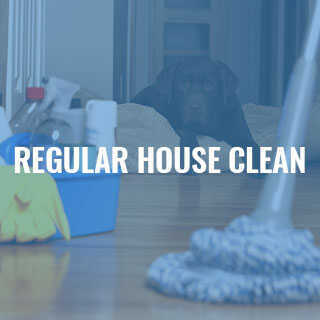 He loves that he can book his domestic clean in just 60 seconds and not have to worry, knowing his dog house is being cleaned by insured and vetted cleaners. Try out Maid2Match and see if you agree! If you’re a busy professional in town, you probably need a break – and the LAST thing you want to worry about is cleaning up a mess at home. Work is tiring, the traffic is always bad, and the kids won’t sit still. Maid2Match can help you with your housekeeping needs. Tidying up can get pushed to the end of your to-do list and it doesn’t always get the attention it deserves. Maybe you have even thought about hiring someone to help you. But where do you start finding the right cleaner? Not many of us are ready to trust strangers in our home, which is why finding a trustworthy and reputable source is so important. There are so many companies offering these services, it is hard to know who is legitimate. How can you find a trustworthy and reliable maid? Many people resort to personal recommendations to find the right cleaner, but there is a limit to how useful this method is. You may get sent a different maid than the person making the recommendation, or you may not even know someone who uses a cleaner in the first place. That is why some companies have created a way for you to book trustworthy and reliable cleaners that have been vetted and approved in advance – all from the comfort of your own home. You need a local company who can offer speed and convenience, with contractors who are fully insured and have gone through a stringent vetting process. Why Hire A House Cleaner For Your Cleaning? Undoubtedly, the first and most important benefit of using a maid service is having a clean home including sparkling toilets, bathroom and kitchen. Cleaning professionals can ensure your home is always neat and tidy. Cleanliness includes all those hard to reach places you always mean to get around to, but never quite have the time for e.g. your oven and the washing of your shower tiles. Without the constant chore of cleaning, you are guaranteed to have a lot of extra time at your disposal to spend on the things that really matter. You can spend more time with your family, or go out with your friends guilt-free. A good booking process makes it effortless and is usually online. Any quality provider will have this option. The beauty of using an online booking and quote system is it makes getting a maid a painless process. With the option to secure a maid in a matter of minutes, you can stop thinking about cleaning and start focussing on more important things. A lot of people are resistant to the idea of using domestic help because they think it will be too costly. Just think about how much of your own time will be saved, and suddenly using a cleaner starts to look really affordable. Even with an affordable price, many people are still wary about allowing a stranger into their home to clean. This becomes a non-issue if the personnel with a company are screened, insured, and comply with all workforce and safety regulations. By using house cleaning professionals, you eliminate those unnecessary risks. Percy has convinced us that we should trust the quality of our highly trained and vetted cleaners. Because of this, in the very rare case you aren’t 100% happy with the clean – we will send your team (or a replacement team) back out to fix it! Why not try out the Maid2Match service and get a quote now! Maid2Match provided a team to clean our home from top to tail. Bookings were easy. customer service center was responsive. The team confirmed the details before arrival. They had all their own equipment and arrived on time to do the most thorough job in our home EVER. They also assisted with laundering and folding that most other cleaners would never touch. They work hard and we highly recommend them. After reading all the reviews online, Maid2match were an easy choice. And they certainly didn’t disappoint! Thanks Karen and team. When choosing a cleaning company to come to your home, there are a few crucial things you should look for. Providing a good experience for customers is not difficult, yet so many companies fail to deliver. That’s why the cleaning service Maid2Match is committed to providing a first class experience for you. Look below to see what you can expect when using this service. Once you decide you need some help cleaning your house, getting a quote is as easy as filling in an online form. All you need to provide is basic information about the size of your home. Every individual that works with us is fully insured, both for injury and accidental damage that could happen. So many cleaners are uninsured and you risk being liable if they are injured or cause damage while at your house. Maid2Match has removed that worry so you can expect a carefree experience. With Maid2Match, you will not be locked into long-term contracts. You may go on a surprise trip, or your financial situation could change. Even when you want to schedule regular visits, you still don’t need to sign an agreement. You can cancel whenever you want, which allows you freedom and control over your schedule. If you are ever unsure you can read more about some of the cleaning industry regulations from the Queensland government or contact the Australian Competition and Consumer Commission (ACCC). No one wants to wait around all day for a maid who never shows up. Maid2Match workers always arrive at the scheduled time and have their vehicles fitted with GPS trackers so it is easy to know where everyone is at all times. This is easily one of the most popular features with our customers! If you have a preference for things such as green cleaning, or anything else that may differ from the norm, we are more than happy to work with you – just let us know! For customers who schedule regular cleans, we offer an even steeper discount on our already low rates. This is great for anyone who can forecast their needs, or who has a clearly set routine. The most important feature of using us is the money back guarantee policy. We stand by the quality of our work! If for any reason you aren’t happy, we will arrange to have the issue fixed, or refund your money. Here’s how to get a great deal on your next clean with Maid2Match.